These complex and at times contradictory judgments emerge from 1) an online survey of more than 2,000 middle and high school teachers drawn from the Advanced Placement (AP) and National Writing Project (NWP) communities; and 2) a series of online and offline focus groups with middle and high school teachers and some of their students. The study was designed to explore teachers’ views of the ways today’s digital environment is shaping the research and writing habits of middle and high school students. Building on the Pew Internet Project’s prior work about how people use the internet and, especially, the information-saturated digital lives of teens, this research looks at teachers’ experiences and observations about how the rise of digital material affects the research skills of today’s students. Overall, teachers who participated in this study characterize the impact of today’s digital environment on their students’ research habits and skills as mostly positive, yet multi-faceted and not without drawbacks. Among the more positive impacts they see: the best students access a greater depth and breadth of information on topics that interest them; students can take advantage of the availability of educational material in engaging multimedia formats; and many become more self-reliant researchers. This particular sample is quite diverse geographically, by subject matter taught, and by school size and community characteristics. But it skews towards “cutting edge” educators who teach some of the most academically successful students in the country. Thus, the findings reported here reflect the realities of their special place in American education, and are not necessarily representative of all teachers in all schools. At the same time, these findings are especially powerful given that these teachers’ observations and judgments emerge from some of the nation’s most advanced classrooms. Asked to assess the overall impact of the internet and digital technologies on students’ research habits, 77% of these teachers say it has been “mostly positive.” Yet, when asked if they agree or disagree with specific assertions about how the internet is impacting students’ research, their views are decidedly mixed. On the more encouraging side, virtually all (99%) AP and NWP teachers in this study agree with the notion that the internet enables students to access a wider range of resources than would otherwise be available, and 65% also agree that the internet makes today’s students more self-sufficient researchers. At the same time, 76% of teachers surveyed “strongly agree” with the assertion that internet search engines have conditioned students to expect to be able to find information quickly and easily. Large majorities also agree with the assertion that the amount of information available online today is overwhelming to most students (83%) and that today’s digital technologies discourage students from using a wide range of sources when conducting research (71%). Fewer teachers, but still a majority of this sample (60%), agree with the assertion that today’s technologies make it harder for students to find credible sources of information. In response to this trend, many teachers say they shape research assignments to address what they feel can be their students’ overdependence on search engines and online encyclopedias. Nine in ten (90%) direct their students to specific online resources they feel are most appropriate for a particular assignment, and 83% develop research questions or assignments that require students to use a wider variety of sources, both online and offline. Asked which online activities they have students engage in, 95% of the teachers in this survey report having students “do research or search for information online,” making it the most common online task. Conducting research online is followed by accessing or downloading assignments (79%) or submitting assignments (75%) via online platforms. These teachers report using a wide variety of digital tools in their classrooms and assignments, well beyond the typical desktop and laptop computers. Specifically, majorities say they and/or their students use cell phones (72%), digital cameras (66%), and digital video recorders (55%) either in the classroom or to complete school assignments. Cell phones are becoming particularly popular learning tools, and are now as common to these teachers’ classrooms as computer carts. According to respondents, the most popular school task students use cell phones for is “to look up information in class,” cited by 42% of the teachers participating in the survey. Yet, survey results also indicate teachers face a variety of challenges in incorporating digital tools into their classrooms, some of which, they suggest, may hinder how students are taught to conduct research online. Virtually all teachers surveyed work in a school that employs internet filters (97%), formal policies about cell phone use (97%) and acceptable use policies or AUPs (97%). The degree to which teachers feel these policies impact their teaching varies, with internet filters cited most often as having a “major impact” on survey participants’ teaching (32%). One in five teachers (21%) say cell phone policies have a “major” impact on their teaching, and 16% say the same about their school’s AUP. These impacts are felt most strongly among those teaching the lowest income students. 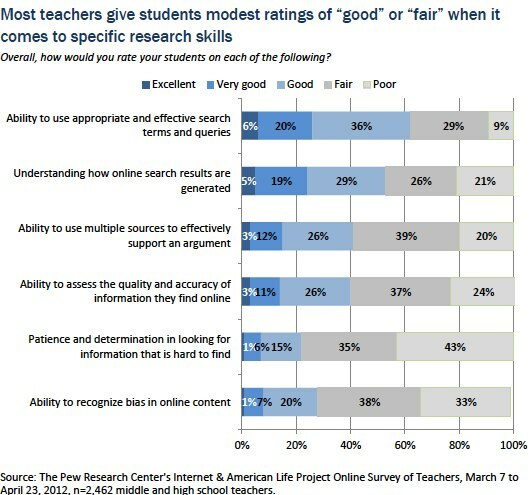 Despite viewing the overall impact of today’s digital environment on students’ research habits as “mostly positive,” teachers rate the actual research skills of their students as “good” or “fair” in most cases. Very few teachers rate their students “excellent” on any of the research skills included in the survey. This is notable, given that the majority of the sample teaches Advanced Placement courses to the most academically advanced students. Given these perceived deficits in key skills, it is not surprising that 80% of teachers surveyed say they spend class time discussing with students how to assess the reliability of online information, and 71% spend class time discussing how to conduct research online in general. Another 57% spend class time helping students improve their search skills and 35% devote class time to helping students understand how search engines work and how search results are generated. In addition, asked what curriculum changes might be necessary in middle and high schools today, 47% “strongly agree” and 44% “somewhat agree” that courses or content focusing on digital literacy must be incorporated into every school’s curriculum. A richer information environment, but at the price of distracted students? Teachers are evenly divided on the question of whether today’s students are fundamentally different from previous generations; 47% agree and 52% disagree with the statement that “today’s students are really no different than previous generations, they just have different tools through which to express themselves.” Responses to this item were consistent across the full sample of teachers regardless of the teachers’ age or experience level, the subject or grade level taught, or the type of community in which they teach. At the same time, asked whether they agree or disagree that “today’s students have fundamentally different cognitive skills because of the digital technologies they have grown up with,” 88% of the sample agree, including 40% who “strongly agree.” Teachers of the lowest income students are the most likely to “strongly agree” with this statement (46%) but the differences across student socioeconomic status are slight, and there are no other notable differences across subgroups of teachers in the sample. Overwhelming majorities of these teachers also agree with the assertions that “today’s digital technologies are creating an easily distracted generation with short attention spans” (87%) and “today’s students are too ‘plugged in’ and need more time away from their digital technologies” (86%). Two-thirds (64%) agree with the notion that “today’s digital technologies do more to distract students than to help them academically.” In focus groups, some teachers commented on the connection they see between students’ “overexposure” to technology, and the resulting lack of focus and diminished ability to retain knowledge they see among some students. Time management is also becoming a serious issue among students, according to some teachers; in their experience, today’s digital technologies not only encourage students to assume all tasks can be finished quickly and at the last minute, but students also use various digital tools at their disposal to “waste time” and procrastinate. Thus, despite 77% of the survey respondents describing the overall impact of the internet and digital technologies on students’ research habits as “mostly positive,” the broad story is more complex. While majorities of teachers surveyed see the internet and other digital technologies encouraging broader and deeper learning by connecting students to more resources about topics that interest them, enabling them to access multimedia content, and broadening their worldviews, these teachers are at the same time concerned about digital distractions and students’ abilities to focus on tasks and manage their time. While some frame these issues as stemming directly from digital technologies and the particular students they teach, others suggest the concerns actually reflect a slow response from parents and educators to shape their own expectations and students’ learning environments in a way that better reflects the world today’s students live in.